This chapel was one of several auxiliaries to the Parish Church of St Mary in Lambeth. It was built in 1793 to serve parishioners who could not cross the Vauxhall marshes to St Mary's. 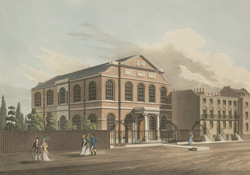 A rectangular building with public galleries on three sides, it became an independent church in the 19th century, and survives as the Church of St Anne on South Lambeth Road.